While we know that ribs, burgers and hot dogs are the all-stars of the grill-side line up, desserts from the BBQ should really take center stage! From a Black Forest cake to tarts, a banana split and grilled coconut kebabs, have plenty of ice cream handy to cool down this smokin' hot desserts! Detailed step-by-step instructions for making Blackened Forest Cake from The Dog's Breakfast. 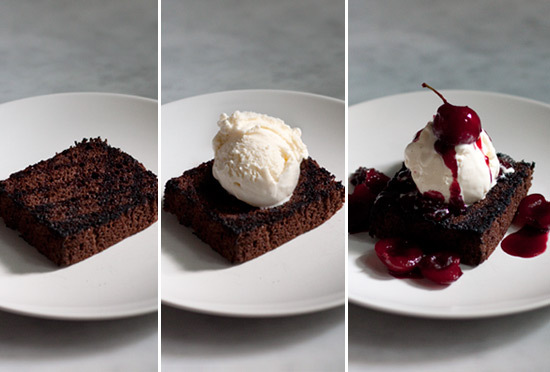 Take chocolate cake, grill it, add ice cream and fresh cherry reduction? My oh my. Why stop at grilled bananas when you can make a banana split?! Take the freshest summer fruits, throw them on the grill and serve a la mode for a perfect dessert. Naturally sweet and deliciously toasty, these sweet kebabs are pretty darn healthy! The spicy crunch of the meringue is the perfect partner for the warm, soft strawberries. Likes a cross between s'mores and a grilled cheese, this sandwich is ooey-gooey goodness from the grill. For a sweet-spicy-salty-umami dessert, this street fare inspired tropical treat is best served on a hot summer day. Rustic Fruit Tarts "Baked" on the grill! Bet you never though about making tarts or pies on the grill, but oh boy are you missing out! Ready in minutes. Quick and easy, fresh peaches are perfect for grilling.